The first race in the Cockwells Saturday Points Series was held on Saturday 29th April with Kevin Maclean in the Ops Room as Race Officer, no doubt given “advice” by old salts, now land-lubbers Maunder & Choak. Weather was "fruity" – translated as sunny, lumpy and bleddy windy with Vice Commodore Chapple recording 27 knots on the reefed Wilkie. The Race Officer sensibly requiring life jackets to be worn sent us on a south easterly group course taken in the lower part of the Queens Roads. 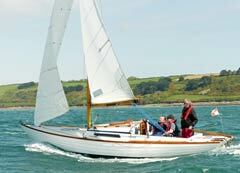 Six boats comprising the two Folkboats Aurora & Aries and Deep Purple turned up from their harbour moorings ready to compete with the GK24s Wilkie, Popincoota & Kaimana who had had to battle the conditions from their distant moorings in the posh corners of the harbour in St Mawes, Loe Beach & Mylor. The rest of the normal regulars understandably stayed on shore and picked their vantage points in keen anticipation. A competitive start line saw the six boats battling a pretty dirty and messy wind towards the Governor. Aurora won the start line with Wilkie having a close battle with the Fairies on Aries and Popincoota and Kaimana struggling with full mains, each other and the Birmingham navy. Wilkie followed the fast disappearing Aurora around the Governor with the fast Aries correcting a navigational error to pop around in third. 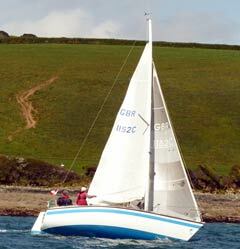 Following a rapid route around the Vilt, Trefusis, Governor, Rustler and the turning mark. 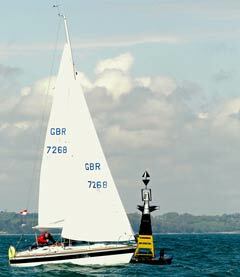 As we came up to the Governor we could see Jack Penty's Noon Hi bobbing about off the Pendennis shore, patiently waiting to finish the Trinity Race competitors. A long afternoon for him and not nearly as much fun as we were having. Thankfully the Race Officer shortened the race with a second round of a tough beat to the Governor a nice reach to the Vilt and a reach and run into the finish. 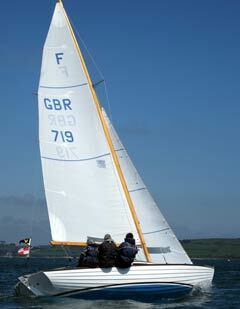 There were remarkably few incidents, but Aries got dizzy having to do a penalty turn after too close a move on Wilkie. Kaimana and Popincoota had a good tustle all the way around. All got round safely despite racing for 90 minutes in what felt like a full washing machine menu of wash, rinse and spin cycle. Aurora won comfortably, Wilkie battled to second on the water and on IRC, but third on the less accurate Byron handicap, Aries coming in third on the water but climbing to second on Byron followed by Kaimana and Deep Purple, with Popincoota retiring.